(Kavli Institute for Cosmological Physics). I am a phenomenologist and I work to tie together physical theories and cosmological observations. My theoretical and methodological research is focused on advancing our theoretical understanding and our modeling capabilities to enable the full exploitation of present and future measurements. 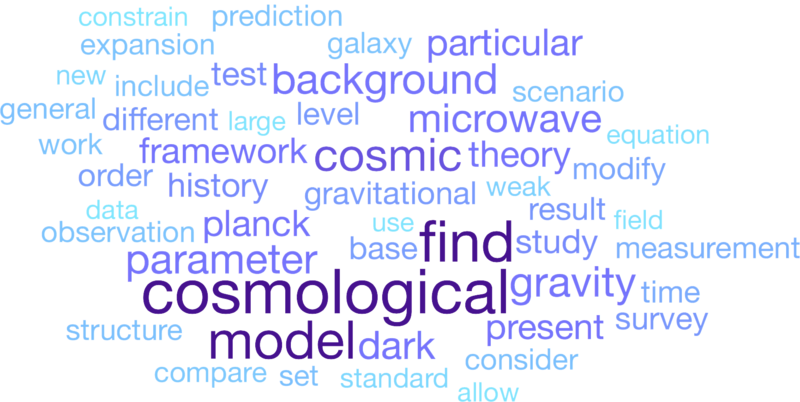 In particular I am focusing my research on Dark Energy, Dark Matter, cosmological neutrinos and Gravity. I am also interested in testing the overall level of agreement of different experiments within the standard cosmological model. Scroll down to find more information about my research interests and publications. As we gather more and more precise measurements small hints of discrepancies between different cosmological probes appeared. The expansion rate of the Universe as derived from cosmic microwave background observations differs from direct measurements from the distance ladder. 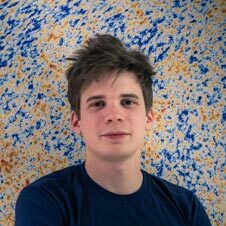 Measurements from large scale structure surveys and the cosmic microwave background show different pictures of how cosmological structures grew over time. How significant are these discrepancies? Can they point toward a radical re-evaluation of our cosmological model? Are they just due to residual systematic effects? Non-standard explanations of cosmic acceleration. 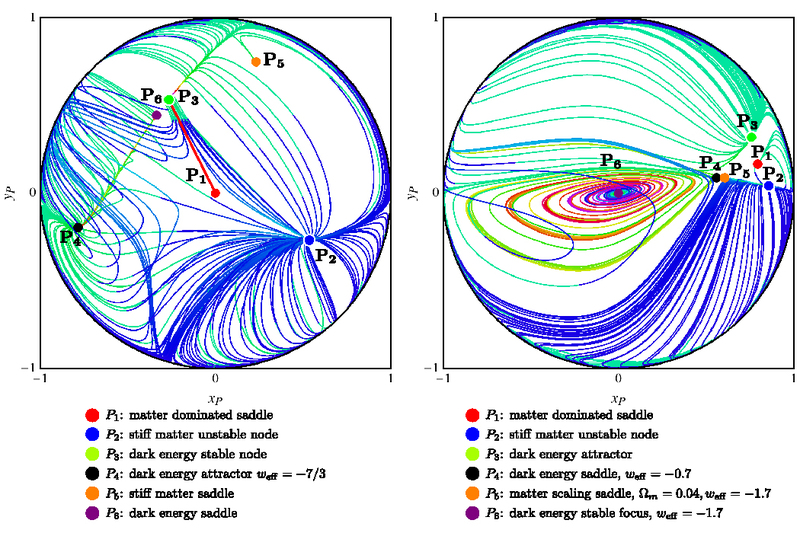 The phase space numerical investigation of different dark energy models for the first order system. 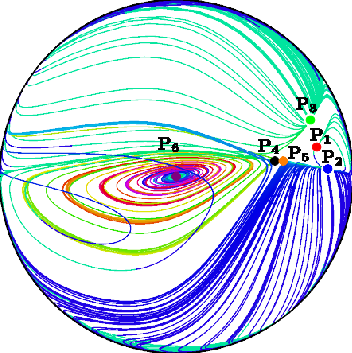 Initial conditions are evolved both in the past (blue lines) and in the future (green lines). The red line corresponds to the ΛCDM trajectory. 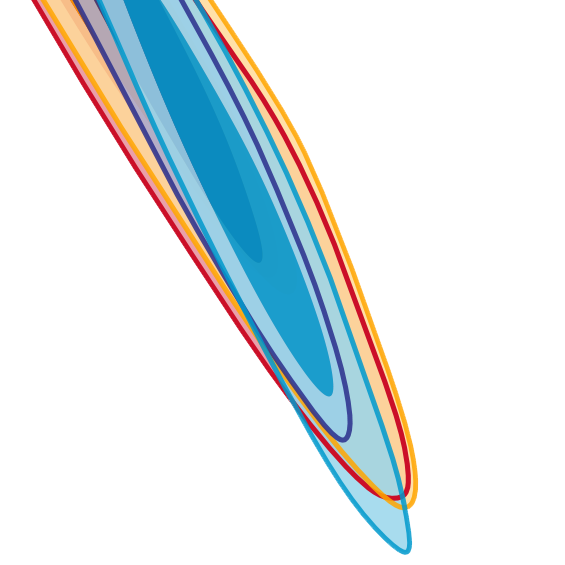 The marginalized joint posterior of a subset of parameters of the K-mouflage model and the Hubble constant. In all three panels different colors correspond to different combination of cosmological probes, as shown in legend. The darker and lighter shades correspond respectively to the 68% C.L. and the 95% C.L. regions. The CMB anisotropy source functions in k-space in units of amplitude of primordial comoving curvature perturbation in two MG example models and GR. Different lines correspond to different physical effects and models, as shown in figure and legend. 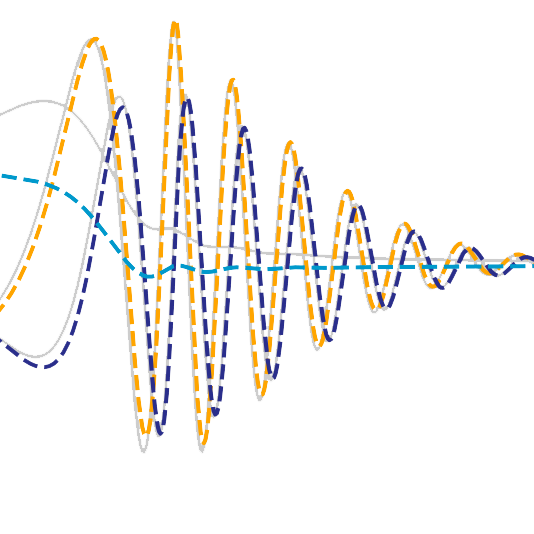 The vertical dashed line shows mode that crosses the horizon at recombination. 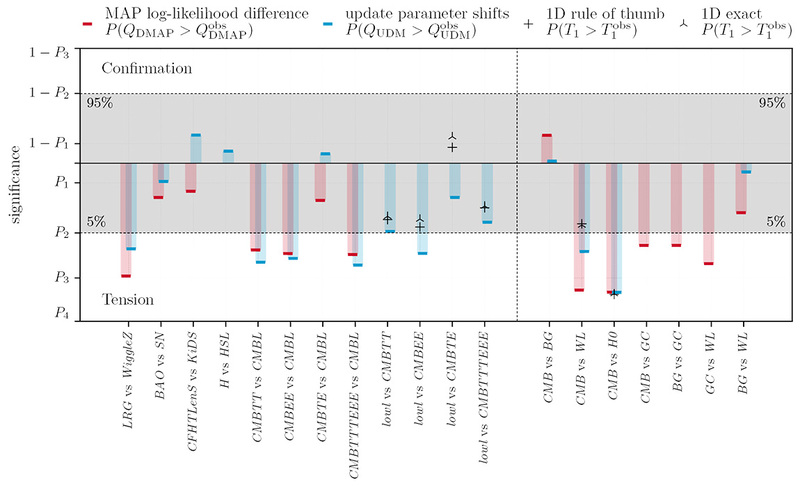 The statistical significance of different Concordance and Discordance Estimators for various data set couples: the difference in log-likelihood at maximum posterior (MAP), the update parameter shifts test, the exact 1D parameter shifts, and the “rule of thumb difference in mean”. Different colors indicate different tests, as shown in legend. 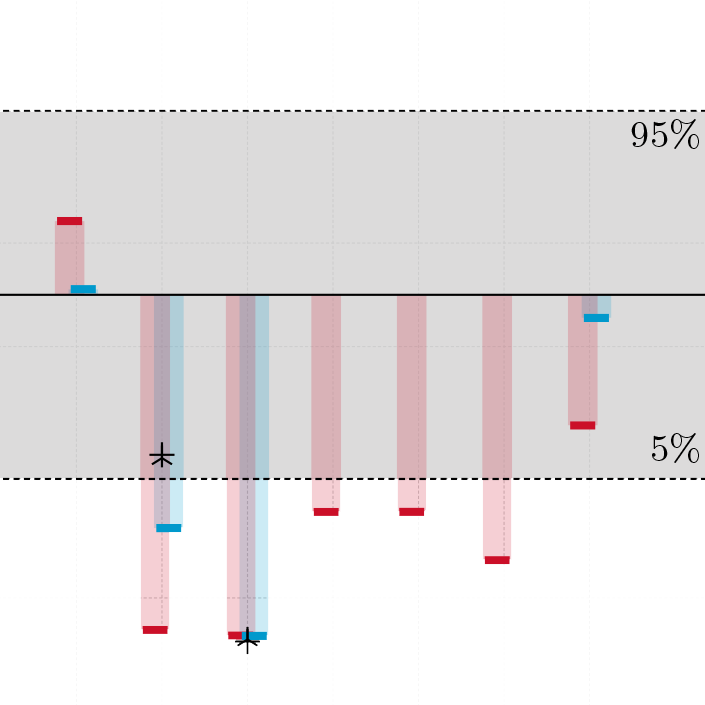 The labels report different levels of statistical significance: P1 ≡ 32%, P2 ≡ 5%, P3 ≡ 0.3%, P4 ≡ 0.007%. Values that are identified as failure modes of one of the estimators are not shown in figure. The darker shade indicates results that are not statistically significant.